Today’s Featured Interview brings us Eva- an illustrator who is currently the junior art director in a local agency. Also known as Evaproductions online, Eva’s work is heavily inspired by storybooks, comics and cartoons. 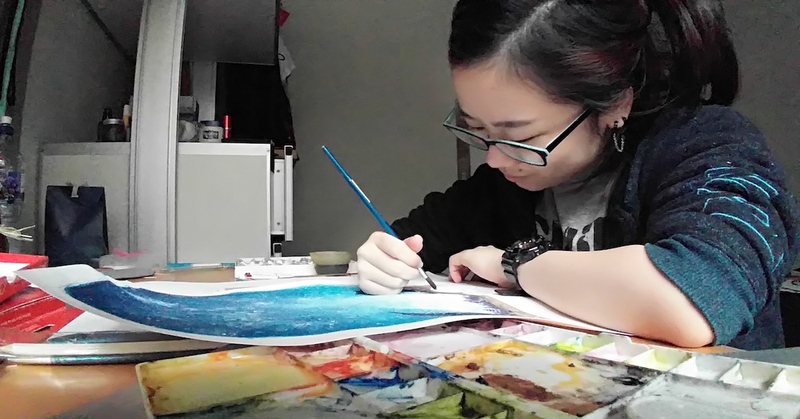 In today’s Feature Interview, the awe-inspiring lass talks about her experiences and art works in hopes to not only inspire other aspiring artists to take the leap, but also to change the society’s perception towards art. Enjoy! 1. Hi Eva, please tell us more about yourself! Hello! I always find this the hardest question to answer, haha. I’m 25 this year and am currently a Jr. Art Director in a digital agency. I graduated with a communication design degree and have been freelance graphic designer and illustrator since my college days. Most of my work are (ironically) heavily illustration based, although I majored in graphic design and technically I had no formal illustration training up until I entered art college! 2. What actually motivated you to dabble into arts? I’ve been drawing for as far as I can remember so naturally it became a very big part of my life especially growing up. When it came to the time when I had to choose which field i wanted to study, I thought hard between having to sit in a lab all day (i wanted to do biology back then!) and drawing all day for the rest of my life, I went with the latter because art, or the creative field in general was something I really love and I wanted to see where this journey would take me. I didn’t regret that decision at all! 3. Can you briefly tell us what Evaproduction is about? Evaproduction was actually created so that I could have a space to dump my doodles/artworks. I didn’t really think much of it back then. But over the years this little “doodle space” gained quite a fair number of followers, and I remembered telling myself: “Wow, there are people actually interested in this random doodles I do?” So eventually I shifted Evaproduction’s direction a little to become a platform for storytelling where I can share comics about my life, thoughts and pretty much anything that comes along the way. 4. So, you love to draw cartoon arts. Is there any story behind it? I grew up with lots of storybooks, comic books and watching tonnes of cartoons. Because of that, I often found myself daydreaming about cartoon worlds, creating stories in my head and sometimes even imagining characters living in this real world! 5. Which one do you prefer- draw with hands or using digital? And why? I’m pretty fluent in both, but if I had to choose it would definitely still be traditional illustration for me! There’s just something (or the feeling) when drawing by hand that you just cannot get when you’re drawing digitally. I find the process much more enjoyable and therapeutic as well. It is that unexpected results you get when you’e using different tools and materials to draw (and of course without the luxury of the undo button!) and I love everything about that! 6. Is there any frustration you faced while drawing, and how do you overcome them? LOTS of it! If I have to name 2 of the biggest frustrations it would be getting the motivation or “mood” to create when you want to, and also not being able to achieve the end result of the artwork that you imagined! I think an artist’s biggest enemy is always our own self. We are our biggest critique and we tend to be really hard on ourselves. I think it’s really important to learn how to find that balance between setting a standard for yourself and not beating yourself up for “not being good enough”. Art is a constant learning process that has literally no end. The best (and also the most challenging) part of it is really just to continuously try and experiment and learn as you go. Sometimes it helps to take a break from creating, to go travel, explore, or even do something else that’s not related to art to get inspiration; and then come back fresh and continue again. 7. What are the struggles you faced along your career path as a graphic designer? They said: “If you do what you love, you’ll never work a day in your life.” and ironically I think I struggle to balance between my work and my own art because sometimes I really don’t feel like drawing or creating at all after doing exactly the same thing during work days. But I still try to push myself to create artworks for myself, because it really helps keep you sane. 8. Where did you seek art inspiration? As cheesy as it may sound, but life is definitely the main inspiration for the art I create. Sometimes it’s the things I observe around me in my daily life. (try people watching, it’s pretty fun!) and most of the time it’s the events that happens in my life that inspires me to share my feelings and experiences. 9. Which artist do you look up to and why? 10. How did you deal with your emotions especially when you received criticism from people about your art work? I actually very much prefer to receive feedback and constructive criticism for my work! It helps me to see what I can improve on and challenge myself to do better the next time. Even if there are harsh comments, I don’t really take them to heart so I guess that helps a lot. 11. Any word of advice to those who’d like to dabble into arts? 12. What is your life motto? Follow Eva on Facebook and Instagram to get the latest updates on her artworks. If you like what you just read and you’d like to inspire someone with their stories, feel free to hit the share button!